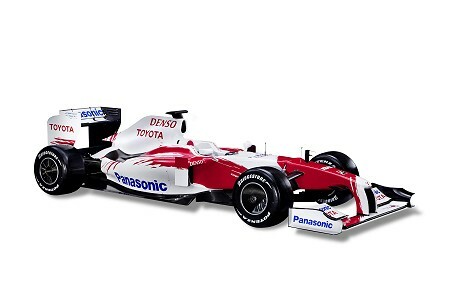 In a low key unveiling on the net today, Toyota revealed their new car for 2009, the TF109. Parts of the package were some odd little videos giving additional shots of the car and drivers, without sound, making it seem as though the team held its breath with the future looming large over its shoulder. Regardless of company press releases, I get the feeling that this is the make-or-break year for Toyota. The car itself is the epitome of Toyota design, so like its predecessors as to leave us wondering what has changed. If there is going to be a norm for the look of this season's cars, the Toyota must surely be it; the TF109 is exactly what the new regulations intended and there seems no attempt to exploit loopholes or retain dubious aerodynamic features. Strangely for a Toyota, the result is a car that looks more finished and developed than any of the others seen so far. It works as a complete concept and, to my eye, is more visually satisfying than the Ferrari F60; it looks balanced and unfussy. Complaints will be heard about the livery, of course, but the retention of Toyota's established colors and style allow the car to be instantly recognizable as a Toyota. I am not a fan of garish and "exciting" color schemes anyway, considering that the quieter liveries let the true character of a car make the necessary statements. Toyota has set their goal this year as a race win and the TF109 looks capable of it, in my opinion. The team has much going for it apart from the simplicity and purposeful new design - the drivers are capable and work well together, the team is well established and must surely be hungry for success by now. Even the likely delay in implementing KERS may work for the team, there being no guarantee that having a working system will be any advantage at all. Toyota's livery designers, along with the Porsche car designers must be the laziest people on the face of the earth ! But having said that, it does have a nice 'uncluttered' look about it, and seems to look less awkward with the new rear wing than the Ferrari. You could be right about this season being the breakthrough for Toyota - after their disastrous 2007 season they really turned it around last year and hopefully can maintain the momentum. What with Ferrari, McLaren, BMW-Sauber, Renault and now possibly Toyota and Williams tipped to have winning cars this season its shaping up to be a good one. I can hardly wait ! I think you're right, Peril - this season looks like being extremely interesting as we watch the teams grappling with the new regulations and, no doubt, finding different solutions to the problems inherent in such drastic changes to the rulebook. It becomes a guessing game as to which teams will come out on top. Hopefully, we will see some upsets in the status quo. I had hoped that with this fantastic effort by the team to finally pull a potential winner together, that they would choose to adorn it with something fresh, but instead it's a rehash of last years decals. I would love to wash all those (faux) paint swatches off to see what this car really looks like. I agree that Toyota's livery hides the details of the car. But don't they all do that on purpose? I would think they are trying to fool the eye and the camera to prevent others from gleaning the nature of their aerodynamic improvements. However, I think Toyota's real improvement may be explained in other ways. One of the things that I think is being missed here is the performance of Trulli and Glock. It has been said that Trulli was ignored while Ralf Schumacher was on the team, and it does seem that the team really came alive after Ralf left. It is quite evident that Trulli came alive. It makes me wonder how much of Toyota's potential was being hidden by Ralf's apparent unwillingness to work with what he had. It seemed like he was always just throwing the race away at the earliest opportunity. So maybe Toyota always had the ability to win races and/or lead be the best of the rest, but they were listening to the wrong driver. I also think that there is no way to tell which team will be the best of the rest. With the change in the rules I really thought that Honda was on their way to making that happen, until they pulled out.... Then I read an article on PitPass that described the last few seasons as the crowning achievement of Fry's style of management, and it goes on to question the ethics of Fry remaining involved in reviewing the bid process when it is rumored he may be interested in the team himself... All this leads me to the conclusion many may already have, that the team, Honda, didn't have a chance before the Honda company pulled out. Too bad... because Button and Barichello deserved some wins for hanging in for so long. Oh but how I would love to see a real battle between Renault, Toyota and Williams where each gains several wins (particularly Toyota and Williams). It would be the perfect compliment to a three way battle at the front of the field between BMW, Ferrari, and McLaren (all are listed in alphabetical order to avoid revealing any bias). Of course after Renault, Toyota and Williams get a couple wins each there won't be many left to fight for... Oh how wonderful my dream world can be. Only last year's races at Spa and Brazil brought comparable levels of complexity.